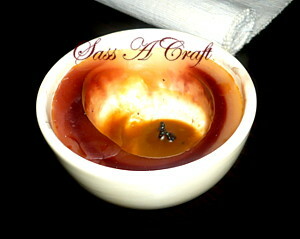 Candle Bowl turned Paperweight | Sass a Craft - Muslim Women are Smart & Crafty Too! Now that's what I call getting one's money worth! After burning this sweet-smelling candle down to the very end, I couldn’t bring myself to discard the bowl. 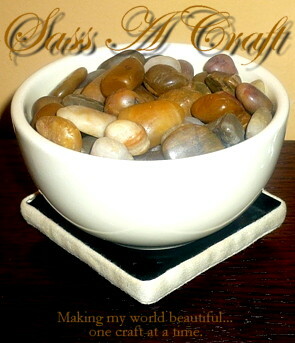 I scooped out the remaining wax, gave it a good scrubbing then, transformed it into a rock-filled paperweight. The tray that it’s nestled upon was once a candle holder itself. I purchased it from the “2 – 200 Store.” Because it was so cheap (2 SAR) it began to rust and one edge started to buck (you get what you pay for). I took the drawstring out of an old khaki skirt, snipped it down to size then, hot-glued it around the brim of the candle tray. That took care of the bucking and topping it off with my paperweight camouflaged the minor rusting. I won’t keep it this way. I have a second tray that I plan to trim with the drawstring as well. They will become coasters in the near future.